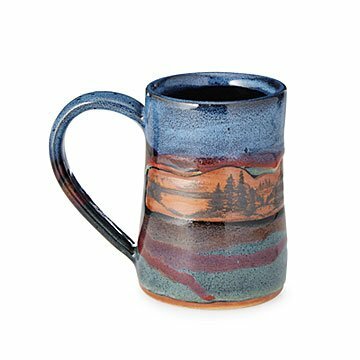 Alan Yarmark looks to the Sangre de Cristo mountains as inspiration for this remarkable, detailed mug. Outside artist Alan Yarmark's studio there's a spectacular display: the wide, reaching Sangre de Cristo mountains. He uses these views as inspiration for this remarkable, detailed mug. Starting with layers of rich glazes, Alan dips the stoneware piece, leaving organic "dripping" edges and a raw center. Next, he transfers a rendering of mountains, lakes, and evergreens to the unglazed band. The result is this rustic, eye-catching design that makes a memorable housewarming or birthday gift for nature lovers. Handmade in Villa Grove, Colorado. This is a beautiful mug. These are extremely well-crafted mugs. I would buy again and recommend them to anyone looking for beautiful functional mugs. Love the mug, my friend loved the mug, would highly recommend! This was a Christmas gift I ordered for my husband, which I stumbled upon while browsing the awesome unique items on this website. We love the look and heft of handmade pottery and this beautiful mug did not disappoint. Generously sized with a comfortable handle, this gorgeous piece will be enjoyed each morning, reminding us of a wonderful trip we recently took to Colorado. I love the mountains of Colorado. This mug makes me think about all of my trips. It's too beautiful to drink out of. It's very pretty. I love the outdoor scene. It's a great size and the handle looks comfortable to use. I'm really happy with it. A Panorama on a Great Mug! Perfect size for my morning tea, or any tea for that matter. Lovely mug, so much so, my daughter wants one. I just love this mug. The quality is superb. Colors were not vibrant, too dark glazes on my mug. The glazes were sloppily applied and, perhaps over fired (scorched), this item should have been classified and sold as a "second". I understand that handcrafted items do vary, but this one was really a second.